Once my husband leaves for work, I sit down at my computer to start typing up something new. I might be working on a blog post, writing out a chapter, creating a new character, scheming up an exciting scene, or simply staring at the screen waiting for something to pop into my head. I am very happy when I am able to put serious effort to get these stages done, but it’s amazing how often I am too distracted to work. One minute I’m writing up a cool moment for my novel and the next thing I see is the neighbor walking across their yard. It would be simple to shut the blinds and take away the image, but my poor cats would lose their entertainment! Okay, since I have to spoil my babies I might as well move upstairs to take away any visual distractions. 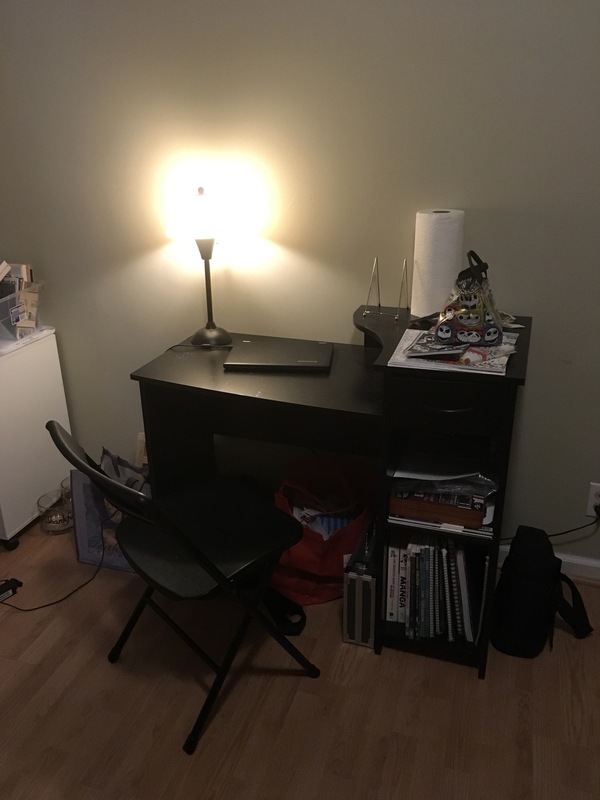 I made myself a room so I could complete my work. No excuses not to lock myself away for a bit. And if I need to step away from writing, my artwork is nearby. Perfect! With everything waiting for me, why am I hanging out downstairs writing? Because I’ve created a schedule I feel the need to follow every weekday. My morning schedule: 1) My husband’s alarm goes off and I wait to see if we’re really going to get up or if we’re going to hit snooze. 2) I go start coffee because we are both addicted to it. I’m not ashamed! 3) Start working on a new blog post. Once I post my latest entry, I mark it as the end to my morning activities. (I didn’t include shower and breakfast because those are kind of randomly placed in there and are obvious tasks I try to complete). After I finish my morning “needs” I can easily go upstairs and get started with completing my novel, right? Kind of. I live in a pretty busy suburb right outside the large city of Nashville. Morning hits and there is constant traffic. Almost every noise grabs my attention for some reason. I’m not sure if it’s some tick I developed back in high school when I was in the band and constantly told to “listen to everything” or if it’s some personal factor I made real for some unholy reason. Whatever the case may be, the traffic driving by during busy mornings or even those solo vehicles moving down our street throughout the day rip me from my work oh so easily. I am sometimes able to pull my attention away from the noises, but I don’t always succeed. Although, I am working on testing out a new plan. I have thought of this plan for a long time and I think it’s way past time to test it out. Music. I love listening to music and singing along with my favorite tunes. My singing is the only factor that is holding me back from acting on listening to music while I write my story. If I started listening to my favorite songs on Spotify while I typed up my story then there’s a chance my characters will start singing Green Day lyrics every time they spoke. Not only would that rip into copyright issues, but to have my professor yell out, “Daddy’s little psycho and mommy’s little solider!” is a sure way to confuse the hell out of my readers. That means there needs to be a bit of an edit to this music idea. My new plan for when, where, how, and what to write is starting to build up. I’ll work in the room featured in the image above and listen to classical music. It should be a good way for me to train my brain to focus on the writing tasks I’m going to be placing in front of myself. I’ve created all these plans and I’m excited to test them out. How do you keep your focus on the different tasks you want to complete?